1Department of Biology, Faculty of Medicine, Universitas Islam Sultan Agung, Semarang 50112, INDONESIA. 2Department of Clinical Pathology, Faculty of Medicine, Universitas Islam Sultan Agung, Semarang 50112, INDONESIA. 3Department of Internal Medicine, Faculty of Medicine, Universitas Islam Sultan Agung, Semarang 50112, INDONESIA. 4Sultan Agung Islamic Hospital, Semarang 50112, INDONESIA. 5Faculty of Medicine, Universitas Islam Sultan Agung, Semarang 50112, INDONESIA. Context: Sodium nitrite (NaNO2) in blood is highly reactive with haemoglobin (Hb), thus affecting hematopoiesis and induction of methemoglobinemia. Aim: This study was conducted to determine the effect of chlorophyll from katuk (Sauropus androgynus) leaves on the level of Hb, Malondialdehyde (MDA), ferritin, and schistocytes percentage in female mice induced NaNO2. Settings and Design: Experimental research was conducted using 24 female mice strain Balb-c. Methods and Material: NaNO2 0.3 ml/head/day given during 18 days, while the chlorophyll or Cu-chlorophyllin as much as 0.7 ml/head/day given the following day for 14 days. Statistical analysis used: Results are reported as mean values ± SD and statistically analyzed by One Way Anova test with 95% significance level. Results: The Hb levels of blood plasma in the control group, NaNO2 induction, induction NaNO2 and chlorophyll of katuk leaves (NaNO2+katuk), induction of NaNO2 and Cu-chlorophyllin from K-LiquidTM (NaNO2+Cu-chlorophyllin) in sequence is 13.29 g/dl; 11.83 g/dl; 14.54 g/dl; 13.99 g/dl, whilst the MDA levels in each group is 2.10 ± 0.11 mol/L, 3.44 ± 0.38 mol/L, 2.31 ± 0.18 mol/L, 2.31 ± 0.13 mol/L, and the ferritin levels is 62.71 ± 6.42 ng/ml; 63.22 ± 7.59 ng/ml; 67.45 ± 8.03 ng/ml, and 64.74 ± 7.80 ng/ml, respectively. The fragment schistocytes ocyte percentage’s in each group is 0%, 0.11%, 0.01%, 0.03%. The ferritin levels tend to increase in NaNO2+katuk. Mann Whitney test results obtained no significant difference in Hb, MDA level and schistocytes percentage between the groups of mice that received NaNO2+katuk NaNO2+Cu-chlorophyllin (p>0.05). 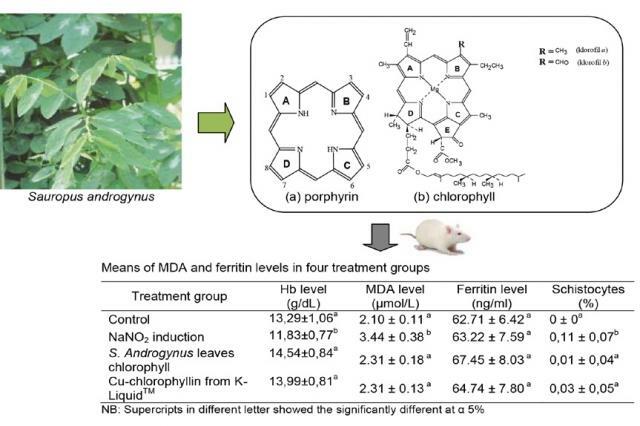 This indicates that chlorophyll from S. androgynus leaves as effective as Cu-chlorophyllin in decrease the MDA levels after NaNO2 treatment, and although not significant, it can increase ferritin levels. Conclusion: The antioxidant activity of chlorophyll from katuk leaves are able to decrease schistocytes percentage’s and MDA level. The increasing of Hb and ferritin level indicates its potential in the treatment of haemolityc anaemia. Further studies aimed at the mechanisms of action of this chlorophyll are needed. Suparmi S, Sampurna S, C.S NA, Ednisari AM, Urfani GD, Laila I, et al. Anti-anemia Effect of Chlorophyll from Katuk (Sauropus androgynus) Leaves on Female Mice Induced Sodium Nitrite. Pharmacognosy Journal. 2016;8(4):375-379.